The Fourth of July, or July 4th is Independence Day in the United States, celebrating the Declaration of Independence of America from Great Britain on July 4th, 1776. 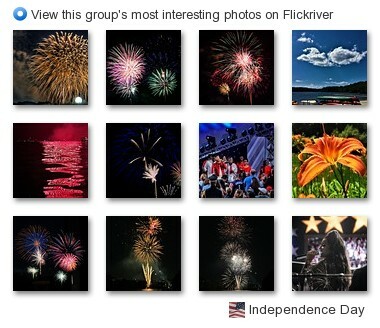 The Fourth of July is associated with fireworks, parades, barbecues, picnics, etc. You can learn more about July 4th, Independence Day on Wikipedia. See a visual presentation (scroll down this page) and download a PowerPoint presentation on July 4th. 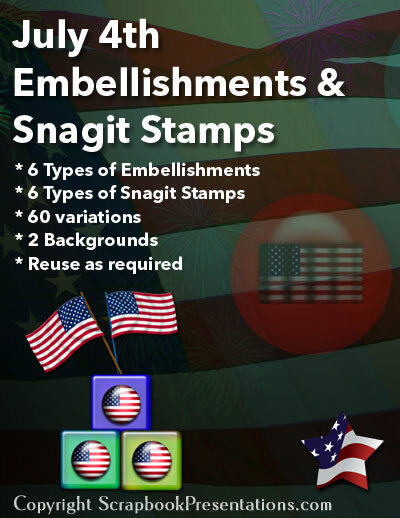 This download contains over 60 July 4th themed scrapbook embellishments and Snagit stamps. You can use these embellishments to create super cool scrapbook presentations. Alternatively, use these as attention-seeking graphics within conventional PowerPoint slides. Additionally you get two backdrop graphics that you can use to create digital scrapbooks and other documents. These backdrops are contained within the kit that you download, and can be used to create super cool backgrounds for your scrapbook.